For RIFF TALKS 6, renowned performance artists K.J. 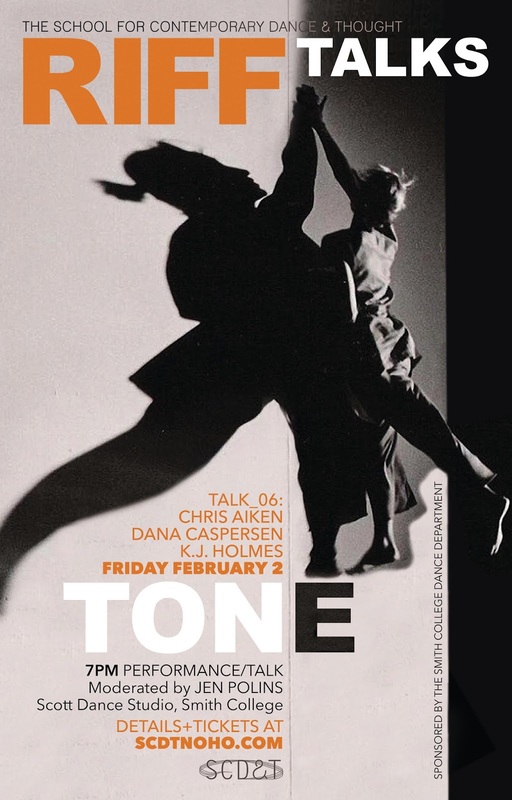 Holmes, Dana Caspersen, and Chris Aiken will perform and converse about the concept of tone in performance. What is the underlying landscape of our actions and perceptions? What adjustments does the performer subconsciously anticipate? How do we recalibrate our actions to suit our environments? Are we ready to move? Ready to change? Ready to perceive? Peter Schmitz, Andrea Olsen, Nancy Stark Smith, Stephanie Maher, Steve Paxton, Lisa Nelson, Otto Ramstad, K.J. Holmes, Daniel Lepkoff, Olive Bierenga, Chris Aiken, Kathy Couch, Yoshiko Chuma, Peter Pleyer, Wendy Perron, Wendy Woodson, Tara Aisha Willis, Jaamil Olawale Kosoko, Cassie Peterson, Joy Miriama Smith, Sara Smith, and Aretha Aoki.